For new parents, choosing the right diaper size can be overwhelming. Not mentioning it has to be switched up every now and then and even switched down sometimes when a baby becomes active. When choosing diapers for your baby, it is important to get the right fit, the right size has to be snug without being too tight or too loose, one or two fingers has to be able to fit between the diaper and your baby’s body. The wrong size will lead to frequent leaks and blowouts as well as discomfort for your little one. It could even irritate your baby’s skin. To determine the right diaper size, you first need to decide what type of diaper you want to use, disposables, cloth or hybrid diapers. Sizes vary according to type. Next, take note of your baby’s weight, that’s the most accurate way to determine your baby’s size. If you opt for disposable baby diapers, you should bear in mind that they are uniform in size. Brands will indicate the age, for example, newborn (N), (NB) or Preemie, but you still have to check the weight range. Different brands may have different weight ranges, for example, your baby could be a ‘’Newborn’’ size in one brand and a size 1 in another brand. It’s wise to check across brands to find which one your baby is most comfortable in. As for cloth and hybrid diapers, they follow a more general sizing, they usually are available in Small, Medium, Large (S, M, L). Some brands offer a one-size-fits-all option. This is why there’s no universal chart for cloth diaper sizes. When picking diapers, remember that your baby will outgrow them in a few months, that’s why it’s recommended not get too many at once. Here are some of the signs that your baby has outgrown his diapers and needs a switch up in diaper size. Frequent leaks and spills are the most obvious sign that your baby’s diaper has become too small. Repeated blowouts especially when you have done everything right is a clue, a diaper that is too small won’t be able to keep its content no matter what. Try a size up if you’re going through such a situation. As obvious as this may sound, it isn’t that simple for most people, when the diaper box size says 12-18 pounds, and your baby is 16 pounds, most often than not, it’s time to switch up the size. The weight limit on diapers are usually based on average sized-babies so your baby could easily be smaller or bigger than average. Try different sizes and different brands, some brands are larger than others even if the size is the same. When diapers start leaving red marks on the thighs and waist, if you can see the lines of the elastic on your baby’s skin, it’s a clear indication that the diaper is too tight. The elastic around the legs and waist should have some stretch, if it doesn’t, then it’s time to move a size up and reduce the pressure on your baby’s skin. The tabs have to be at the center of the waistband, there should not be skin under the elastic area of the tab. If you find it difficult to connect the diaper tabs at your baby’s waist, then it’s probably time for a change. Normally, a diaper should close without you tugging and pulling on it. The right fit has to be right under your baby’s belly button, if it’s way under then it’s too small or if it’s above then the diaper is too big. On diaper boxes, size is always listed according to month and weight, generally, the month is merely indicative, as your baby could be slightly smaller or bigger for his age. Sizes per month are based on average babies, and realistically many babies do not conform. The most reliable and accurate estimate will be based on your baby’s weight. Size NB/Newborn - For small or average-sized newborn infants. Size 1 - For larger newborns and infants up to 3 months old. Size 2 - For infants from 2 to 6 months old. Size 3 - For infants and toddlers from 5 months to 2 years old. Sizing by weight is as close as you can get, when it comes to choosing diapers, the weight measurements are often grouped in such a way that you’re good to go if your baby falls within the given range. For example, 6-10 lbs or 8- 14 lbs, a baby weighing 9 lbs can be comfortable in both groups. 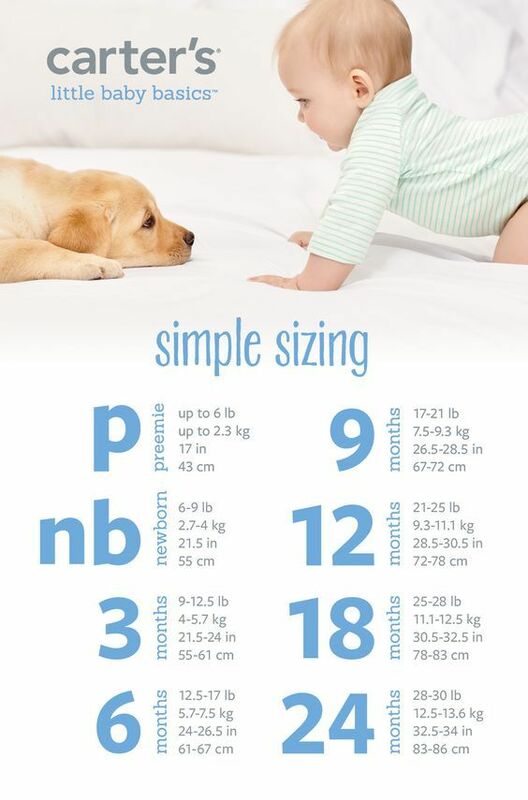 Below is a typical diaper size chart by weight ranging from 6 - 34 lbs and a Pampers size chart by weight and age. The diaper sizes of Pampers and Huggies follow the same scheme. However, Pampers also offers diaper sizes for older or bigger children with the Pampers Cruisers size 7. As earlier mentioned, diaper sizes by age are usually based on the average baby. It’s recommended to consider the age in correlation with the weight to be safe. And sizes vary with brands, unlike with cloth diapers disposables tend to be slightly different across brands, it is never generic. Some brands begin their diaper sizes at preemie- very small sizes made for premature babies and babies small for their age at birth. Others start at ‘’Newborn’’ for the average baby, and moves right up to toddlers and children of about four years of age. Whatever the case, you might want to buy the size for your baby’s age across several brands, and try them to see what fit is ideal. Switching up diaper sizes should be something you consider every 3-4 months, depending on how fast you notice changes in your baby. Infants grow very fast and so to should their diapers. You should consider using slightly larger diapers even if the current ones are not yet tight, this is because the size of a diaper determines its absorbency. The bigger the size the more it absorbs, aside from your baby’s comfort, this is reason enough to switch up when you can.